Here’s the Flyer that we’re currently circulating around some of the local schools. 19th November, our opening night, is now less than a month away. Rehearsals are at full momentum and often interspersed with costume fittings. There is also a whole host of weasels, field mice and other creatures that I’ll give credit too when I can. The Directors are Dee Thorne & Lee Stroud. We are still desperate for help behind the scenes and Front of House. We’re also hoping to get donations for raffle prizes as well. Anything you can help with please give us a call. Tickets – Hold Fire, tickets are being printed and should be available next week, after half term. There will be a booking number to call for tickets, 01305 268692. You will also be able to buy tickets from Trinity Stores in Trinity St.
We’re doing 4 performances, 19th November 7:00pm, 20th November 7:00pm, 21st November 2:00pm & 7:00pm. 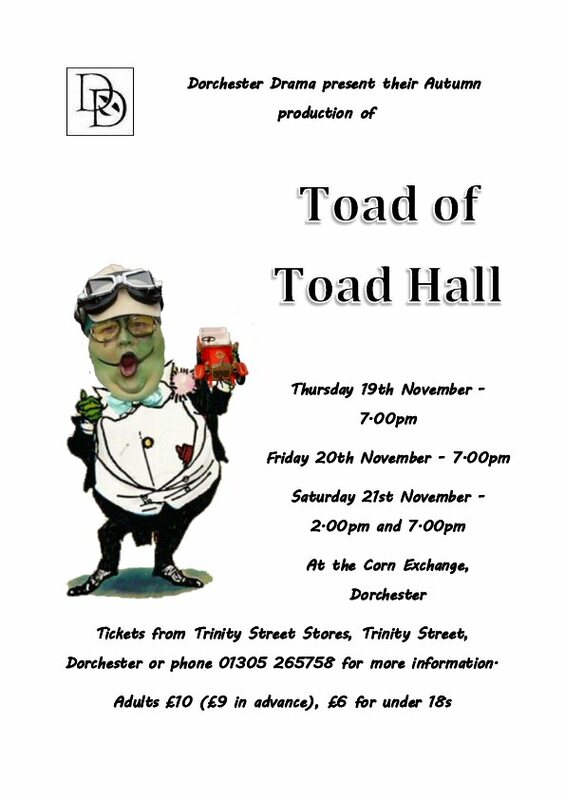 All performances will be at the Corn Exchange, Dorchester. Prices will be £9 in advance or £10 on the door. All children’s tickets will be £6.